Easy adjustmentjust loosen and reset adjusting bolts. 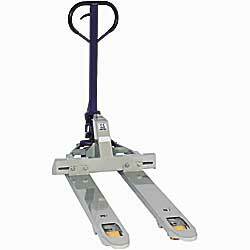 Two pallet trucks in one! Adjustable forks can be set to handle multiple size loads. Easy adjustment at oncejust loosen and reset front and rear adjusting bolts. 5,500-lb. capacity truck also includes: adjustable fork tie rods, pump overload bypass valve, entry and exit rollers, and rubber coated handles. Mold-on polyurethane wheels: 3"W load, 8"W steering. 5-year pump warranty. IN STOCK. XA-2300 200	 2127 x 48"	 2-5/87-1/2"